Jomo Kenyatta was born at Ng'enda in the Gatundu Division of Kiambu in the year 1889. His parents were Muigai and Wambui. James Muigai is his stepbrother. As a boy, Kenyatta assisted his grandfather, who was a medicine man. Kenyatta took interest in Agikuyu culture and customs. He received his preliminary education at the Scottish Mission Center at Thogoto. He also received elementary technical education there. He was later baptized a Christian with the name of John Peter, which he changed to Johnstone. He changed his name to Jomo in 1938. He lived among Maasai relatives in Narok during World War I. Here he worked as a clerk to an Asian trader. After the war, he served as a storekeeper to a European firm. At this time, he began wearing his beaded belt Kinyatta. He married Grace Wahu in 1920, the mother of Peter Muigai and Margaret Wambui. He worked in the Nairobi City Council water department between 1921-26 on a salary of about Shillings 250.00 per month. Though he owned a shamba and a house at Dagoretti, he preferred to live closer to town at Kilimani in a hut and cycled home during weekends. By 1925, he was one of the leaders of the Kikuyu Central Association (KCA), which chose him to represent the Kikuyu land problems before the Hilton Young Commission in Nairobi. Thus starting his career in politics. In 1928, he published his newspaper, Muigwithania that dealt with Kikuyu culture and new farming methods. KCA sent him to England in 1929 to influence British opinion on tribal land. After touring some parts of Europe, including Russia in 1930, he returned to Kenya to fight the case on female circumcision with the Scottish Mission. He supported the independent schools. In 1931, he again went to England to present a written petition to parliament. He met Mahatma Gandhi of India in November 1932. After giving evidence before the Morris Carter Commission, he proceeded to Moscow to learn Economics but was forced to return to Britain by 1933. During the gold rush, land in Kakamega reserve was being distributed to settlers. This made Kenyatta angry and spoke about Britain's injustice. For which reason he was dubbed a communist by the British. He taught Gikuyu at the University College, London and also wrote a book on the Kikuyu language in 1937. Under Professor Malinowski, he studied Anthropology at the famous London School of Economics (LSE). In 1938, his book, "Facing Mount Kenya" saw the light of day. It was about Kikuyu customs. During the World War II , Kenyatta served on a farm in the United Kingdom, while owning his own farm there. He married Edna Clarke, mother of his son, Peter Magana in 1942. Along with other African leaders, including Nkrumah of Ghana, he took part in the 5th Pan-African Congress of 1945 in Manchester. When he returned to Kenya in 1946, he married Wanjiku, Senior Chief Koinange's daughter, who gave birth to his daughter Jane Wambui. During his travels in the countryside at Kiambu, Murang'a and Nyeri, he took the opportunity to contact the local people and to speak to them. His last wife was Mama Ngina, the mother of Christine Uhuru, Anna Nyokabi and Muhoho. In 1947, he took over the leadership of KAU from James Gichuru. On October 20, 1952, Sir Evelyn, Baring, newly appointed Governor of Kenya of two weeks, declared a state of emergency in the country. Jomo Kenyatta and other prominent leaders were arrested. His trial at Kapenguria on April 8, 1953, for managing Mau Mau was a mockery of justice. He was sentenced to 7 years in imprison with hard labor and to indefinite restrictions thereafter. On April 14, 1959, Jomo Kenyatta completed his sentence at Lokitaung but remained in restriction at Lodwar. Later, he was moved to Maralal, where he remained until August 1961. On August 14, 1961, he was allowed to return to his Gatundu home. On August 21, 1961, nine years after his arrest, he was freed from all restrictions. On June 1, 1963, Mzee Kenyatta became the first Prime Minister of self-governing Kenya. At midnight on December 12, 1963, at Uhuru Stadium, amid world leaders and multitudes of people, the Kenya flag was unfurled. A new nation was born. A year later on December 12, 1964, Kenya became a Republic within the Commonwealth, with Kenyatta, as the President. 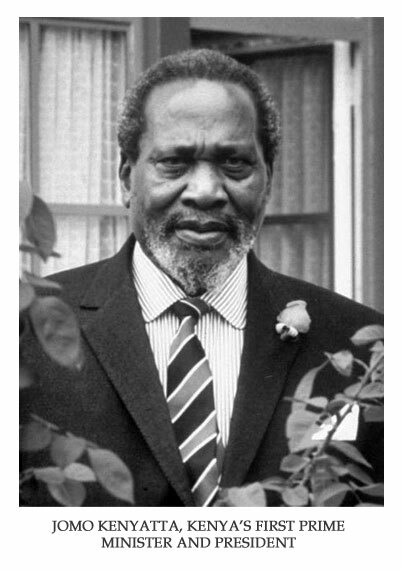 Mzee Kenyatta is acclaimed from all quarters of the world as a true son of Africa, a renowned leader of vision, initiative, guidance and an international public figure of the highest caliber. Kenya under the "Baba Wa Taifa" (Father of the Nation) had enjoyed political stability, economic progress as well as agricultural, industrial and educational advances. From 1974 onwards, Mzee declared free primary education up to primary grade 4. He died on 22nd August 1978 at 3.30 A.M. in Mombasa at the age of 89 years, while there on a busy working holiday for the last time. President Kenyatta is acknowledged as one of the greatest men of the 20th century. His rule will go down in history as a golden era in Kenya's positive development. KENYATTA ..... Taa ya Kenya or Swahili for the 'Light of Kenya' was the man who brought the light of independence to Kenya. Indeed, he was a beacon, a rallying point for suffering Kenyans to fight for their rights, justice and freedom.